Where the spirits of the dead loom amongst the living and Old Town Trolley takes you on a haunted journey you’ll never forget. Your Gravedigger Host will share with you the tales of Savannah’s past and its spooky side. Then, we’ll explore Perkin’s and Sons Ship Chandlery; only Ghosts & Gravestones gives you exclusive nighttime entry for this haunting experience. The streets and squares of Savannah are most stirring when the sun goes down… come if you dare aboard the Trolley of the doomed for a “frightseeing” journey and explore the most haunted places in Savannah. Known as the “most diabolical crime in the history of Savannah,” the horrific Gribble House axe murders incited citywide fear and speculation in 1909. The triple murders of Maggie Hunter, Carrie Ohlander and Eliza Gribble inside the home led to many accusations during the investigations. Ultimately, only one individual was sentenced to death. The Gribble House was subsequently torn down and a garage has taken its place. Haunted happenings have been reported in the area to this day. 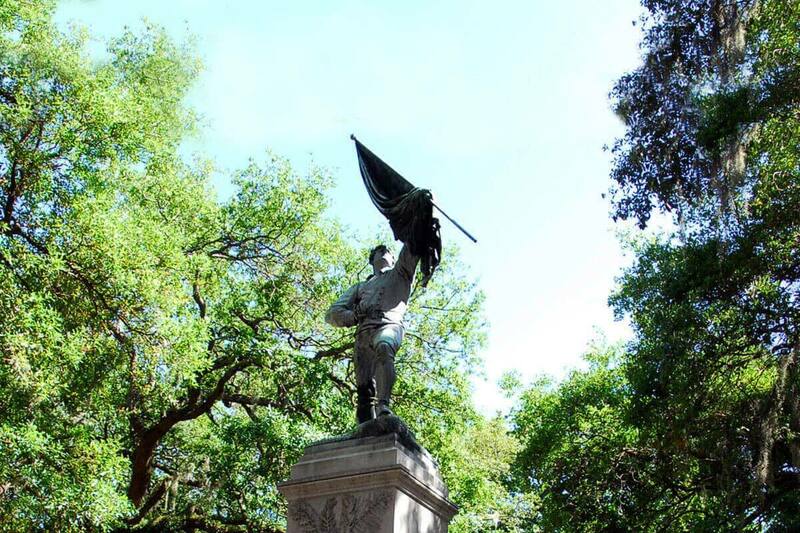 Besides the infamous Gribble House homicides, Savannah’s history is filled with Revolutionary and Civil War battles, serving as important parts of the city’s ghostly and historical memory. 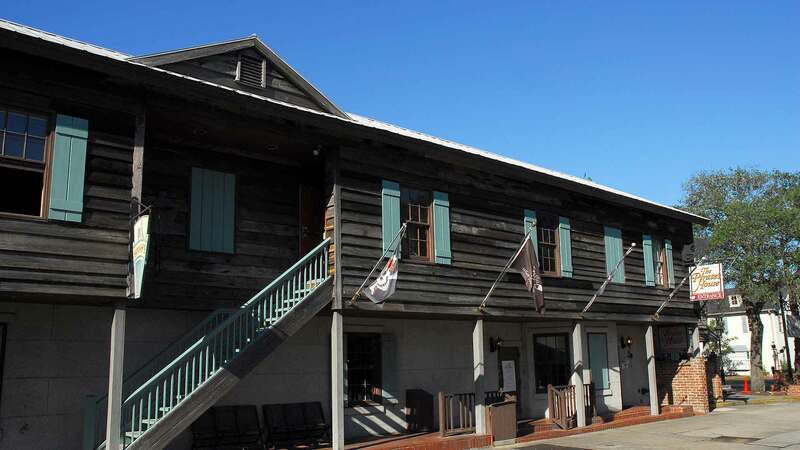 The 250 year old Pirate’s House is located in one of Savannah’s oldest buildings. With its underground tunnels that lead from the basement to the river and history of pirates and sailors, the Pirate’s House certainly has its share of intrigue. Today, the restaurant serves up delicious fare and a little something extra for the brave at heart—the chance to have an encounter of the supernatural kind. 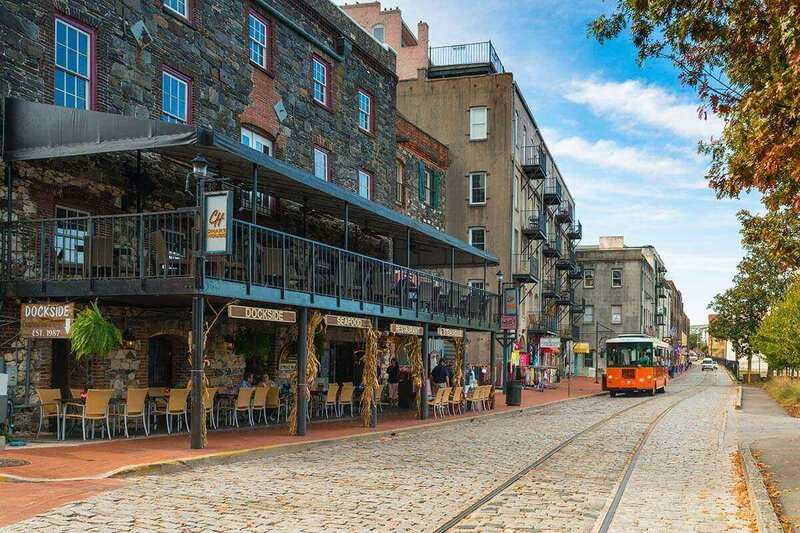 It is believed that several ghosts haunt this Savannah icon, including various sailors who appear to be floating from table to table. Many have also reported seeing the spirit of Captain Flint, who is said to have died in the Pirate’s House. Other spooky accounts include the sounds of voices and people moaning coming from within the tunnels—which, before they were closed off, were used to shanghai people, forcing them to work on ships. The story goes that men would drink at the bar, get inebriated and pass out, only to wake up miles off shore on a boat. Are the stories of see-through sailors and ghostly pirates true? No one knows for sure, but one thing’s for certain, the Pirate’s House is a favorite among ghost hunters and paranormal enthusiasts. Built in 1851, The Marshall House was taken over by Union General William T. Sherman’s men in the winter of 1864 and used as a hospital for the troops. It has been documented that when the troops occupied the hotel, the ground was frozen and doctors were forced to bury the amputated arms and legs of patients under the floorboards. More than a century later, when the hotel was under restoration, workers found human remains—the hotel was closed and deemed a crime scene until they realized that the area was used as a surgical room during the war. There are many ghostly stories surrounding this historical building, including ghost sightings of Union soldiers walking about in uniform, one carrying his severed arm who appears to be in search of a surgeon. Other poltergeist occurrences include the spirit of a woman who has been seen in the rest room where one of the stalls locks itself repeatedly even though no one is in it. Guests of the hotel have seen the misty shapes of children and experienced the feeling that someone was tickling their feet while they were trying to sleep. Nestled between Bay Street and River Street, Factor’s Walk was once a bustling center of commerce for Savannah’s cotton industry. It was home to the original Cotton Exchange, where the prices of cotton were determined for the entire industry worldwide. These brick, two and three storied buildings contained offices and warehouses and were connected by iron and concrete walkways. Today, thousands of people visit Factor’s Walk to frequent the pubs, restaurants, antique stores and specialty shops that are now housed inside the buildings. But there’s another aspect to this charming historic area, the one that includes the ghosts of those that lived, died and passed through here. The heartbreaking tales of murder, accidental deaths and slavery are real accounts of Factor’s Walk’s past and present. Many who visit have seen the shadows of slaves that were brought into the city by boat and others have heard the tormented moans coming from the tunnels, secret passageways and catacombs that still exist. Still others say that they felt as if someone with cold hands was touching them. A must see for ghost hunters, Factor’s Walk offers more than its share of mysterious experiences. One of the most scenic spots in Savannah, Madison Square is a popular stop for many sightseeing visitors. The square, which was named for James Madison, the fourth president of the United States, features a statue of Sergeant William Jasper, a soldier in the Siege of Savannah who was killed during battle. Surrounding the square are stately private homes and St. John’s Episcopal Church which was completed in 1853. Like all the squares in Savannah, it has such an interesting history including battles during the British occupation in the Revolutionary War. On the outside, the area is enchanting and peaceful, but what lurks around when the sun goes down is an entirely different story. For many years, Madison Square has been known as one of the most haunted outdoor places in Savannah. Bodies of buried British Soldiers found during the construction of homes that frame the square are just the beginning—and perhaps an indication of just how much turmoil took place here centuries ago. Those who’ve walked through the square at night report a tall, dark, shadowy figure coming right towards them and then disappearing. Others feel a chill in the air, even on the warmest night. Strange sounds, chilling sensations and shadows abound here and entice ghost hunters to discover them. 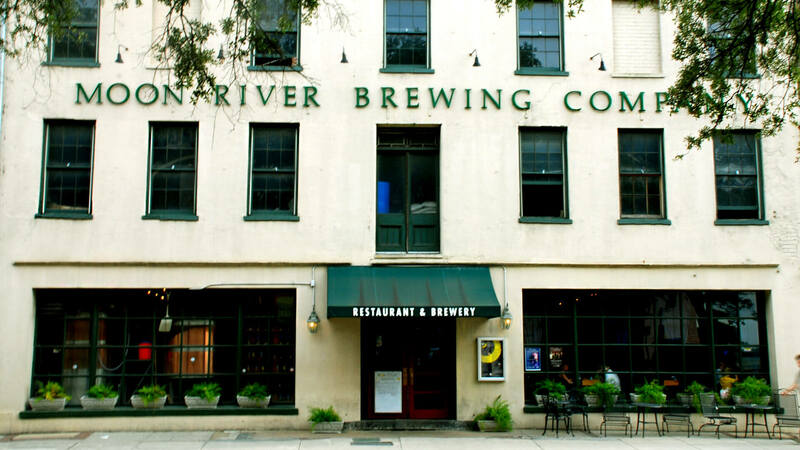 Deemed as one of historic Savannah’s most haunted locations, the Moon River Brewing Company has been visited by TV shows, Ghosts Hunters and Ghost Adventures. The building itself was built in 1821 and was originally the City Hotel. An elegant gathering place for Savannah’s high society folks, the hotel hosted many prestigious guests until General Sherman captured the city in 1864 during the Civil War. It was also a hospital and like many medical facilities during that time period, served those struck with yellow fever. Hundreds of men, women and children died inside the rooms of this building, so it’s not too shocking that many of the poltergeists spotted in recent years are the spirits of children. In the basement, a malicious spirit the staff has named Toby, haunts and taunts anyone who dares to venture downstairs. While upstairs, the spirit named Mrs. Johnson causes trouble of her own. Visitors to the brewing company say they’ve seen a woman in period clothing at the top of the stairs staring down at them and it’s not unusual for folks to feel like someone bumped into them and touched their faces, even though it is apparent that no one is there. Explore the building and keep a watchful eye and ear for unnatural occurrences, you never know; one of the resident spirits may just be looking at you. The city of Savannah has so many haunted places; it’s almost impossible to narrow them down to just 7. Of real significance is The Sorrel-Weed House, located at 6 W Harris Street. This lovely mansion was built in 1838 and is a popular stop for most travelers to Savannah. 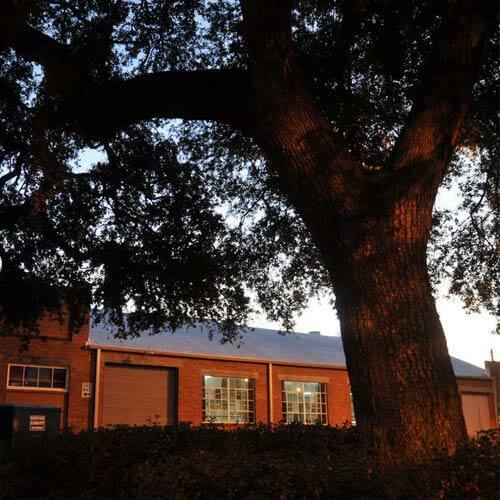 It is also known as one of Savannah’s most haunted buildings. Check it out along with the other Top 7 Most Haunted Places in the city; you may have a paranormal encounter of your own.